Take to the sky to lead the resistance against Morcubus and his drone army and to stop his plans to take over the skyways. 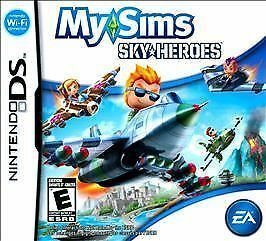 MySims SkyHeroes is an all new adventure that brings the thrill and high speed action of flying to the creative, immersive world of MySims. Go from unknown pilot to celebrated hero as you defeat dangerous enemies in aerial dogfights, test your reflexes in fast-paced speed challenges, and take on massive enemy bosses that demand all your skill as a pilot to survive. As you progress, you build, customize and tune your aircraft to give you an edge in combat – upgrade your wings for swifter maneuvers, switch out your engine for a speed boost, or change the paint job to camouflage your plane and avoid enemy fire. Face Morcubus’ drones with an ally in split-screen cooperative gameplay, or take the game online to challenge your friends in fun, competitive 10-player high speed action. Morcubus and his drones must be stopped; will you rise to the challenge?! Adventure Story – Become the Hero who defeats Morcubus and saves the skies from tyranny. Air Combat – Take on dangerous enemies in high speed air battles that range from dogfights to air raids to rescue missions. Boss Battles – Defeat Morcubus & drones in epic boss battles. Customization – Build & tune your aircraft to optimize it for battle. Up to Four Players – Fly with or against your friends in online co-op and PvP gameplay.